The amount of pumpkin spice items is unholy. Truly just terrible. From pumpkin spice pretzels, coffee, yogurt, ice cream, dog treats and granola bars, I think it’s excessive. As a loyal former Dunkin’ Donuts employee, I will say that their pumpkin iced coffee is the closest to heaven I’ll ever get, but who needs pumpkin spice dog treats? I’m looking at you, Greenies. My dog will never touch one of those. Can dogs even appreciate pumpkin spice?? Why not just stick to chicken flavor? I mean… come on. M&M’s, marshmallows, Oreos, Pop-Tarts, Jell-O… it’s crazy how far pumpkin spice has gone. There was even a rumor of a pumpkin spice condom. Should that happen in the future, I will lose faith in humanity. I swear. 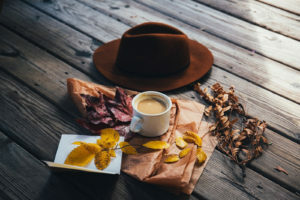 However, fall is my favorite season and we all need some fall flavor, so here are some great alternatives to the basic Starbucks PSL. If you get it with cream only, it’s the perfect blend of sweet and cinnamon. Seriously, delicious and simple. Their pumpkin muffin is also a perfect mix of frosting, cinnamon and pumpkin bread. When I worked at Dunkin’ I had to bake these fresh and I would make one with extra frosting just for myself. It’s the little things in life. If I go to Pavement, Death Cream is already my go-to drink, but this is the perfect blend of my favorite season and drink. It’s not too much flavor, so you won’t feel gross and sugary after drinking it. You’ll actually feel refreshed, which is amazing since maple is mostly just sugar flavor. Starbucks also has a maple pecan latte and salted caramel latte for the fall, which I believe are better than the PSL option. Their caramel apple spice is also so good that I learned how to make the recipe at home with my roommate. But I will admit that their pumpkin scones are amazing (I think it’s all the frosting). If you’re really into fall treats, I would recommend apple pie, apple crisp, apples, apple picking, apple cider, caramel apples, candy apples and maple candy. Seriously, how did we forget about the joy of apples in the fall and obsess over PSLs? Apple may be the most underrated flavor out there and it is particularly ignored in its main season. While pumpkin is delicious, the obsession has gone too far. Explore maple, reinvigorate your love of apple, or just stick to normal pumpkin-flavored items. No need to make your dog eat pumpkin spice treats or to make pumpkin spice s’mores with pumpkin spice eggnog and top that all off with pumpkin spice everything else. We have to draw the line somewhere.